Preheat your oven to 350 degrees and oil two 9-inch cake pans with coconut oil (up the sides) and set aside. I prefer using a convection oven as the moisture will create a really moist cake. Add the monk fruit sweetener, vanilla and egg yolks into the avocado bowl. Place the egg whites in a separate bowl. Beat the avocado mixture until creamy and well mixed. Place the chocolate chips into a small, microwave-safe bowl and microwave in 30 second intervals, stirring between each interval, until the chocolate is melted. Add the chocolate into the avocado mixture and beat until well incorporated. In a separate small bowl, stir together the coconut flour, tapioca flour, baking soda and salt.Stir it into the avocado mixture until mostly mixed in. Then, beat it with the hand mixer until totally mixed. Beat the egg whites on high speed until they form stiff peaks, which takes about 4 minutes. Gently place the whipped egg whites into the bowl with the cake batter and GENTLY fold them into the batter until no white streaks remain. Divide the batter between the two prepared pans and bake until a toothpick inserted in the center comes out clean, about 25 minutes. Let cool to room temperature in the pans. Place into the refrigerator for 20 minutes to let it thicken. Once the mixture has thickened, frost away. Posted on January 19, 2017 by Izabel Olson and filed under Recipes and Nutrition and tagged chocolate cake diary-free sugar-free gluten free recipe Recipes. The other day I was in the supermarket and saw one of my all time favorite fruits: Persimmon. Though I avoid sugar, my health coach allows me to eat fruit a few times a week. I couldn't resist but buy this sweet goodness that I only see once in a blue moon in Chicago. I whipped up the most satisfying and amazing smoothie with it. I have to caution you that this is a very thick smoothie. So if you prefer a less thick consistency, you will need to water it down a little bit. 8. 1/2 cup of sprouted Brazil Nut milk (see recipe here). Place all of the above ingredients on the vitamix and blend well. Careful: This smoothie is addictive! Posted on December 1, 2016 by Izabel Olson and filed under Recipes and Nutrition and tagged green smoothie delicious green smoothie raw vegan green smoothie persimmon recipe detox recipes plant-based recipes. If you have a sweet tooth, but don't want to jeopardize your clean eating, I highly recommend you try out this brownie recipe. As I cut all of the sugars from my diet, I had to find new ways to satisfy my sweet tooth. This was particularly difficult during competition prep, when my coach wouldn't even allow me to eat fruit! This recipe uses ingredients that have a high protein content (eggs and protein powder), does not contain sugar, gluten, or lactose. This brownie is completely safe to eat - even during contest prep!!!! I promise you'll want to eat this brownie for breakfast... Except you won't be feeling any guilt! Optional ingredients: 1tbsp of nut butter, and 1 teaspoon of Lakanto chocolate powder. These ingredients make the brownie extra yummy - but it depends if you can afford the added fats or not. Mix the egg and the cashew milk in the mug. If you are adding peanut butter start mix it in with the egg mixture. It won't dissolve completely, but that's ok. Mix in the dry ingredients in the mug till you achieve a homogeneous dough. Microwave it for anywhere between 60 seconds and 1 minute and 20 seconds (some microwaves take a little longer - you may have to play with yours and see). Posted on November 23, 2016 by Izabel Olson and filed under Recipes and Nutrition and tagged nutrition hacks nutrition brownie fit brownie gluten free dairy free sugar free Recipes competition prep recipes competition prep brownie. Posted on June 30, 2016 by Izabel Olson and filed under Recipes and Nutrition and tagged detox Recipes plant-based recipes detox recipes watermelon herbs detox juice. Green Shake to Get your Diet Back on Track! But, the excess sugar and fat has some really terrible side effects... I have been waking up puffy and feeling bloated. I decided, it was time to break away from this sugar addiction I developed in the past few months... And, the only thing that helps me get out of a sugar slump is.... a Green shake. Green shakes are a nutritional powerhouse. When you nourish your body, your cravings diminish because your body does not need to search for particular nutrients that may be missing in your diet. When you feed your body properly, you eat less. After a week, I started diminishing the sugar in the shake by taking away the dates and slowly bringing my body back to a more strict diet. Hope it works for you! Posted on March 23, 2016 by Izabel Olson and filed under Recipes and Nutrition, Nutrition Hacks and tagged nutrition hacks nutrition nutrition secrets green smoothie raw vegan green smoothie green juice delicious green smoothie raw vegan plant-based recipes plant based diet easy plant-based. Travel Blender: I never travel without a travel blender, unless I am 100% sure there is a raw vegan juice bar by my hotel. I own a powerful travel blender called nutri ninja (The link is in the bottom of the page). It has 900 watts of power - a vitamix has around 1500 watts - so this travel blender is pretty powerful. So powerful in fact, it could probably serve as your main blender at home. It makes great green smoothies in the morning even when you add fibrous veggies. I went on a holy yoga retreat recently and all of my cabin mates thought I was crazy. I brought my little blender along and instead of having pancakes in the morning - I would save the greens from the night before and blend them in the morning with a banana and my pre-packed superfood goodness (which is my next must have item). Which reminds me, bring small plastic zip lock bags to collect greens and fruit from the buffet at your hotel or restaurant and place them in your room fridge for later use. Also, when you book your hotel, request a fridge. Let them know you have special dietary needs, and they will usually oblige. Pre-packed superfoods: As I said before, a little planning goes a long way when traveling. Nobody wants to lug around boxes and containers to make a green smoothie. What is a girl to do? Pre-pack all of her smoothie goodness into little plastic ziplock bags. I prepare one bag per day of my stay that way even if I don't find greens I can blend a banana (which is available anywhere) with my super foods. I usually add Amazing Grass Green Superfoods ( link at the bottom of page) - a raw and amazing supplement, some maca (link at the bottom of page) which helps with stress and my immunity, and some hemp seeds for a clean, whole food source of protein. I make sure to feed my body well first thing in the morning so I don't feel any cravings. The smoothies usually tide me over till lunch time. Portable morning shots: Every morning I take a shot after drinking my 32 ounces of water. I usually have a wheatgrass or turmeric and ginger shot, but, finding a shot on the go can be quite challenging. First, because there are no travel juicers I know of (trust me I have looked), and second because juice bars are not available in your destination. So if my research shows no juice bars close to my hotel, I bring a powdered wheatgrass drink. It is not as effective as the real thing, but it helps me keep my routine consistent - and consitency is key in keeping with a healthy lifestyle. Sometimes, I even add it to my water throughout the day when traveling because it is such a great detoxifier. Hemp seeds: Hemp seeds make my world go round! Seriously, these little tiny seeds can turn any lame salad into a nutritional powerhouse. Sometimes, it may be hard coming across a good plant-based meal when traveling. So I bring my hemp seeds and I add it to everything I eat. I buy Manitoba Harvest (link below). Hemp seeds are the most nutritious seed in the world and a complete protein. They have a balanced profile of protein, essential fats, enzymes, and vitamins with low sugar, starches, and saturated fats. Adding these seeds to salads, soups, and meals keeps me satiated for a longer period of time as well. Keeping me from eating too much junk when on holiday. Accessories: Always bring reusable cutlery, and a water bottle or travel coffee mug. You will need it to create your smoothies and keep yourself hydrated throughout the day. I love the bamboo cutlery to-go ware makes and I have a set (link Below). You could use plastic cutlery - but who wants to trash the environment? Justin's chocolate almond or hazelnut butter packs : Have you tasted Justin's Chocolate Almond Butter? If you haven't - maybe you shouldn't... They are so good, it is hard to stop eating them. But, if you have enough self control these little packs make a great on the go snack (with a banana) or a late night healthy indulgence. I love eating something sweet and delicious in bed, so I bring these little packs of amazingness along and I eat them with bananas. It can also make for an amazing breakfast if you can't make a green smoothie. Posted on December 10, 2015 by Izabel Olson and filed under Recipes and Nutrition, Nutrition Hacks and tagged travel hacks hacks nutrition hacks holiday travel nutrition hacks holidays holiday nutrition healthy travel how to stay healthy when traveling how not to gain weight when traveling. Wanna change your life in 2016? Would you like to completely reshape yourself in 2016? Maybe you want to gain consistency in your yoga practice or you have been toying with the idea of following a plant based diet, but have no idea how. 4) Weekly guides to Yoga practice with Yoga fat-burning circuits, pranayama, and asanas to help you shed extra pounds - that is a month of yoga! Each guide will help you prepare for a week in January. The first guide will be sent out in the last week of December and will have the first steps to transition to a plant-based diet, 6 complete yoga workouts (including breath work, meditation, yoga fat burning circuits and yoga practice you will follow throughout the month - these are exclusive videos not available on my blog), and nutrition tips and life hacks to lose weight and feel great all year long! All you need to do now is sign up and I will send you the first guide in the last week of December so that you can prepare for the new year! Posted on December 5, 2015 by Izabel Olson and filed under Yoga Flows, Recipes and Nutrition, Articles about Yoga and tagged new year nutrition new year commitment nutrition plant based diet transition to a plant based diet 30 day yoga challenge 30 day beginner yoga yoga life hacks hacks fitness fitness hacks. 1) Drink lots of tea! Tea is warming and comforting. It fills you up and fools you into thinking you are having a dessert... I have two all time favorite winter teas: Rare Tea Cellar's Gingerbread tea dream Rooibos (buy here), and Republic of tea Peppermint Chocolate Rooibos (buy here). Both are caffeine free Rooibos blends which contain polyphenols that have anti-inflammatory and antioxidant properties. This will help shed any water retention you may be experiencing. I usually add some agave and steamed hemp seed milk. It gives the tea a creamy and decadent taste - even my picky eaters love it! It is a warming and amazing ritual that will substitute the need for comfort foods in the winter. 2) Too cold for a green smoothie, but would like to have the same benefits? Eat an amazing green oatmeal instead! I love green smoothies, but it is hard having a cold morning meal in 20 degree weather. I need to wake up with something warm and invigorating in the morning. So, I eat oatmeal when it is too cold, but I add greens and other goodies. I make my oatmeal overnight in a slow cooker, it is super easy and it allows you to have steel cut oatmeal which is the one that will give you the most benefits. I blend 1 cup of packed spinach with a banana and a little bit of cashew milk and then mix it in with my oatmeal. This creates a full meal that is warming and has similar benefits to a green smoothie. 3) Buy a UV lamp! Did you know Vitamin D is not really a vitamin? It is rather a hormone that your body produces when exposed to sunlight. If you live in the northern climates you know that there is not a lot of sun around here to help you produce this valuable nutrient. In fact, many autoimmune diseases are linked to a deficiency of vitamin D... No wonder these kids of diseases are more prevalent in colder climates. As the benefits of vitamin D supplements are still debatable, I recommend you get a UV lamp. Just turn it on while you are getting on with your morning routine. Or maybe use it while you are working. You will see drastic improvement in your mood and you will produce vitamin D as a result. 4) Drink lots of warming foods, like soup, and add lots of warming seasonings to your foods like ginger. Traditional Chinese medicine recommends we avoid raw foods during the winter because they cool the body and compromise our digestion and ability to assimilate nutrients. This means we should focus on lots of soups and stews using root vegetables, dark leafy greens, beans, whole grains and seaweeds. Ayurveda also recommends warming foods and suggests the use of warming spices - this means lots of ginger, cumin, turmeric, and nutmeg. The beauty of soups and stews is that you can set a slow cooker before you leave for work with all of the ingredients, and come back home after work to an amazing meal. Try it! 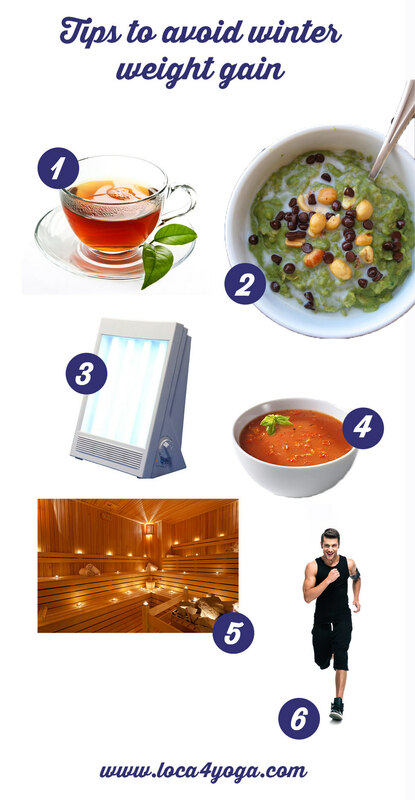 5) This is the time for a Sauna! It is no wonder the Finnish are known for their Saunas... Finland is freaking cold! There is evidence suggesting that individuals that engage in sauna bathing are less likely to get colds. Also, when your body is exposed to heat, it produces more white blood cells... Seriously people! A study found that sauna bathing stimulated the immune system - specially those of athletes. Being in a sauna also makes you feel good and warm and it is a great ritual to partake in a cold afternoon. 6) Move your body. Exorcise the winter blues and burn a few extra calories by adopting a running regimen. Can't run, then do whatever exercises suits your fancy. But, make sure you exercise regularly. Exercise increases blood flow and warms the body. The rise in temperature has a soothing and calming effect. Research has also shown that a regular exercise regimen strengthens your immunity helping you fight those winter bugs. Talking about winter bugs, regular exercise keeps the winter blues at bay by releasing serotonin and dopamin within 10 minutes . These feel-good chemicals boost well-being and make us feel happier. That's it! Those are my hacks. I hope it helps you get through this winter! Posted on December 2, 2015 by Izabel Olson and filed under Nutrition Hacks, Recipes and Nutrition. I love pumpkin pie. It is the one thing I look forward to all year.... However, I do not love the effect that dairy and flour has on my body. Since banning both these bad boys from my diet - after all I do not have to gain 1000lbs in a year like a newborn calf - I had to find alternatives to this holiday staple. The best recipe I have found is Mathew Kenneys' pumpkin pie with shortbread crust. If you are unfamiliar with Mathew Kenney, he is a gifted chef that finds way to make raw dishes taste better than regular ones. In fact, if you are every in Santa Monica, CA his restaurant, M.A.K.E., is a must visit. I went and I think I ate for hours. I didn't want to leave. HIs food is... delicious. Anyway, here is his recipe that I am following and giving my family. This recipe is Bella approved - meaning my one year old ate it and loved it! To make the crust: In a dry vitamix container make a flour out of the shredded coconut. Make it as fine as possible. In a food processor combine coconut flour, cashew flour, and remaining ingredients for curst. Process till mixture can be pressed between fingers. Press into a 9 inch tart pan. To make filling: Blend all ingredients in a vitamix except for the coconut oil. Slowly blend coconut oil till the mixture is well combined. Pour mixture into prepared crust and put in the freezer till it is hardened. Then you can keep it in the fridge. Enjoy and have a healthy and turkey-free Thanksgiving! Turkeys will thank you for that! Posted on November 26, 2015 by Izabel Olson and filed under Recipes and Nutrition and tagged pumpkin pumpkin pie raw vegan pumpkin pie recipe raw vegan pumpkin pie recipe d dairy free gluten free vegan raw vegan raw foods. Spirulina is a superfood and a nutritional powerhouse. It is a blue-green algae usually found in freshwater lakes and it is a great source of vegetarian protein. It contains all nine amino acids needed to synthesize protein in the human body. In fact, 60% of the weight of spirulina is composed of pure protein! Unlike animal flesh, spirulina is quickly absorbed by our bodies making it even better than meat. The cell walls of this wonder algae don’t have cellulose, so it is 90 percent digestible. This means it has higher absorption than any other common plant revitalizing your body quickly and effectively. Spirulina has a lot of micro-nutrients including vitamins, minerals and antioxidants. It contains vitamins A, B, C, D, E, and the minerals iron, calcium, potassium, and magnesium. It contains a series of antioxidants as well, including phycocyanins, tocopherols and beta-carotene. Because of its macro and micronutrient profile, many professionals use spirulina to treat metabolic diseases like hypothyroidism, diabetes, obesity, and high cholesterol. Spirulina is also used to treat nutritional deficiencies including iron deficiency. Peel the bananas, cut them into pieces and put them in a container in the freezer overnight. In the morning peel the grapefruit. Put it in a blender with the spirulina, water, stevia to taste, your dark leafy greens, and the frozen banana. Blend everything in a blender until it is smooth. Drink as soon as possible! If you have any questions, take a look at the video below! Posted on November 21, 2015 by Izabel Olson and filed under Recipes and Nutrition and tagged spirulina raw raw vegan recipe raw vegan recipe green smoothie raw vegan green smoothie. Harness the power of fruits and veggies to revitalize your body! A friend of mine has MS and wanted to kick start a self-healing process through nutritional lifestyle changes. She asked me to help her, so I planned to get her started in a juice fast. I wanted to flood her system with all sorts of vitamins and antioxidants to create the conditions necessary for healing. In autoimmune diseases like MS, the body rebels and starts to attack itself, rather than foreign invaders. Research points to several culprits including: allergies, food sensitivities, nutrient deficiencies, exposure to heavy metals, pollution, plastics, chemicals such as bromide in flour, and even certain drugs. No wonder today we are dealing with an epidemic of autoimmune diseases as these are all parts of our daily lives. This juice detox is based on the truth that God created the world with everything necessary to give us health. The food around us has different colors because of their unique nutrients, enzymes, and antioxidant combinations. Therefore, I created seven juices (the biblical number of perfection) each with a unique color to flood her system with a diverse range of nutrients, antioxidants, and enzymes. Feel free to drink as much juice as you would like. The objective is not to feel hungry, but rather to give your body a break from the difficult job of digestion. The idea is to drink juices exclusively, but freely for two days. But please, always consult your physician before starting any new health routine. If you are not prepared to do a full cleanse, then maybe just add some of the juices to your daily routine. Start with the first juice and drink all of the juices in order. Drink more juice if you feel like it, whatever is necessary to satiate you. There is also a broth recipe in case you feel a craving to eat something salty (all recipes are below). Throughout the cleanse you should not drink coffee as it is acid forming. Instead, you should wean yourself off of coffee a week or two before the cleanse and drink as much green tea as you would like. Matcha green tea is specially a good choice because of its higher caffeine and antioxidant content. Another good idea is to maybe start a vegan or raw vegan diet a week or two before the cleanse so that your body is not in a state of shock. By giving your body a break from digestion, it will be able to self-heal and rid itself from toxins. If u have access to a sauna, use it. But avoid strenuous exercise, instead engage in pranayama (breath work) and meditation. Upon getting up: Drink 32 ounces of water to hydrate your body and break the fast state its been in all night. Blend the lemon juice, watermelon, and cayenne in a blender. Put all of the ingredients through the juicer. I prefer using a slow juicer (I like the Hurom). Put all ingredients in the juicer, except for the basil and spirulina. Once the juice is ready, blend it with the two remaining ingredients. Put the kale, beet, and pear in the juicer. Then blend it with the acai . Agave or any other natural sweetener to taste. Soak a cup of raw almonds in purified water. After 8 hours drain the water and place the almonds in the blender. Add three cups of mineral water, half of a vanilla bean and the agave. Blend all of the ingredients. Then use a nut milk bag (or any bag made of fabric will work) to strain the milk from the nut pulp. Drink the milk, but save the almond pulp as you could use it later for raw almond cookies! 1 medium celery, 5 carrots, 4 onions, 5 cloves of garlic. Fill it with water. Cook for 4 hours or until the vegetables are soft. Put cayenne and use kelp seasoning to make it salty. Throughout the detox process turn your heart to God and pray for healing. Maybe take a moment to pray before each juice thanking God for your life and the deliverance that will be received. Also, take the opportunity to make lifestyle changes and after the cleanse continue to eat whole foods – the ones that God created and intended for us to eat. Posted on November 3, 2015 by Izabel Olson and filed under Recipes and Nutrition and tagged raw vegan bulletproof coffee raw foods juicing juice detox cleanse. I love coffee so when I heard of bulletproof coffee I was beyond myself. Bulletproof coffee's inventor David Asprey claims that his concoction can give you long lasting energy ( he claims up to 6 hours), can assist weight-loss by helping users engage in a form of "intermittent fasting" which triggers ketosis (a metabolic state triggered by a lack of carbs that makes your body burn fats), can kill cravings, and can boost cognitive function. Ok so the list seems a little too good to be true, but I thought that the idea of mixing healthy fats and coffee a very interesting one. 60% of your brain is made up fat. So good fats are an important fuel of cognitive function. The original bulletproof coffee uses grassfed butter and coconut oil to boost the intake of omega-3 fatty acids and butyrates. Both of these reduce inflammation in humans and are said to prevent cancer and control hunger. Bulletproof coffee also uses special coffee beans said not to contain mycotoxins (which apparently is a fancy name for coffee mold). This claim seems bogus to me though as coffee growers have utilized a process known as "wet processing" since the 1980s to rid their beans of mold. But, that is besides the point. I was in NYC last spring when I saw a sign for bulletproof coffee. I really wanted to love it. I mean, it seems that the drink is a silver bullet. I remember proudly holding my first cup of bulletproof coffee in a beautiful NYC morning.... Then, I took my first sip.... My initial happiness quickly turned into disgust. I gagged. It was so gross. The fatty buttery taste was a turn off for me. However, the experience did teach me something: Blending coffee with butter made it really creamy... I thought it could be a great way to substitute my morning latte. That is, if I could ever find something less gross than butter to blend it with. Then I got home and I had a tub of Artisana coconut butter staring at me. If you are not familiar with it, Artisana is a very serious company that delivers a fully raw and delicious product. I love coconut butter and oil and try to use it as much as I can. Coconut butter contains medium-chain fatty acids (MCFAs) which are burned for energy and don't usually go for fat storage. Coconut butter stimulates your metabolism and helps you burn more fat. In fact, American farmers tried to fatten their cows using coconut oil. But, what happened was the exact opposite! Place both ingredients in the blender and blend away. Drink right away and enjoy the energy! Posted on October 27, 2015 by Izabel Olson and filed under Recipes and Nutrition and tagged coffe raw vegan bulletproof coffee raw vegan raw vegan weightloss coffee for weightless. Every year I am fortunate enough to accompany my husband to the two biggest trade shows in the natural and organic industry. 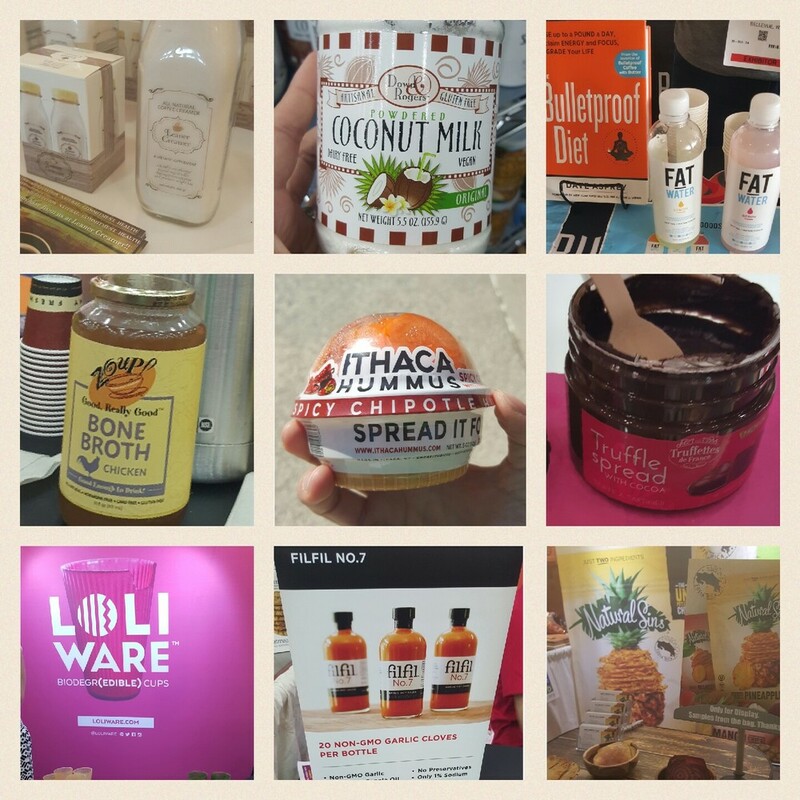 Last week, I went to the natural products East which takes place in Baltimore. I love this show because you see all of the new natural products that have yet to reach the market! Here I share my favorite picks from the show last week! I hope you enjoy my picks and look out for these amazing products in the supermarkets! Fat water - After the bulletproof coffee craze, here comes fat water... The name is pretty self explanatory - basically water with added fat... David Asprey the creator of bulletproof coffee, has now come out with this product that promises to hydrate your body and burn more fat. They extract fat from coconut oil and infuse the water with it - the end result is a 20 calorie bottle of water that promises to keep you full and burn fat. Personally, the verdict is out for this one... I think I prefer eating healthy sources of fat like avocado, or coconuts as a whole food, but I found the product interesting. Truffettes Truffle Spread: If you like Nutella, you will love truffle spread. First because it doesn't have all the additives that Nutella does, secondly because it is just as sinful, if not more. Keurig 99% compostable cups: If you own a Keurig and have not heard of #killthekcup , then you need to do your homework... K-cups are non-recyclable and Keurig produced enough k-cups in 2013 to encircle the earth 10.5 times! Even the inventor of K-cups wishes he hadn't invented them in the first place. But oneCoffee, a Canadian company, has come up with a 99% compostable K-cup! I loved this product and hope to see it in stores soon! Posted on October 6, 2015 by Izabel Olson and filed under Recipes and Nutrition and tagged expo east natural products natural product trends organic foods. Make a batter in the blender using the 2 eggs, the banana and the hempseeds. It is better to make it the night before and leave it in the fridge as it thickens over night and the dough is not as runny as when you make it right before you eat it. Pour the batter over a griddle and sprinkle with some dark chocolate stevia sweetened chocolate chips. Cook it on both sides. Once it is golden brown remove from griddle and eat! Posted on October 6, 2015 by Izabel Olson and filed under Recipes and Nutrition and tagged recipe gluten free pancakes 4 ingredient pancake.